Galloway Township Police responded to a Motor Vehicle Accident on October 28, 2013 at 6:37 p.m. The accident according to Police occurred on the White Horse Pike (US Rt-30) and S. Donna Drive, Pomona section of the Township. Police described the accident as a Car vs. Motorcycle. 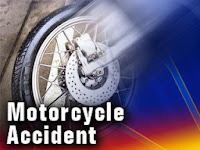 Two vehicles that were headed eastbound on the White Horse Pike collided, resulting in injury to the motorcycle driver. The collision is still under investigation. A 2000 Mercury Mountaineer and 2009 Suzuki Hayabusa 1300 were the vehicles involved in the accident. Donovan Myers (26 y/o male of Galloway) and Frankely Paredes (31 y/o male of Egg Harbor Township), were involved in the accident. According the Press of Atlantic City, Paredes was off-duty from the Atlantic City Police Department. Frankely Paredes was transported to Atlanticare Regional Medical Center City Division for a head injury. He is listed as critical, but stable condition, according to Galloway Police. White Horse Pike was closed for 3-hours while the Galloway Twp. Ambulance Squad, AtlantiCare Medics, Pomona Volunteer Fire Company, NJ DOT, NJ State Police and Atlantic County Prosecutor’s Office assisted Galloway Police. Summons have yet to be issued as the accident is still under investigation. Ptl. K. Costa #86, Ptl. S. Garrison #90, Cpl. G. Bollinger #58 are the investigating Officers.